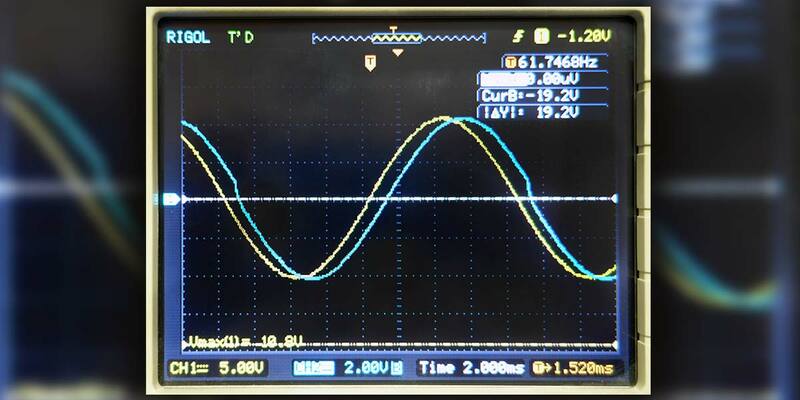 Customers sometimes require that our crystal controlled digitally synthesized 60 Hz oscillators be synchronized to the 60 Hz line. Synchronization is essential when you need to switch a load between two independent sources, such as the 60 Hz line and a 60 Hz oscillator (with a power amplifier). A simple relay can be used to switch between them. However, the sources must be synchronized. Otherwise, large potentially damaging transients will occur. 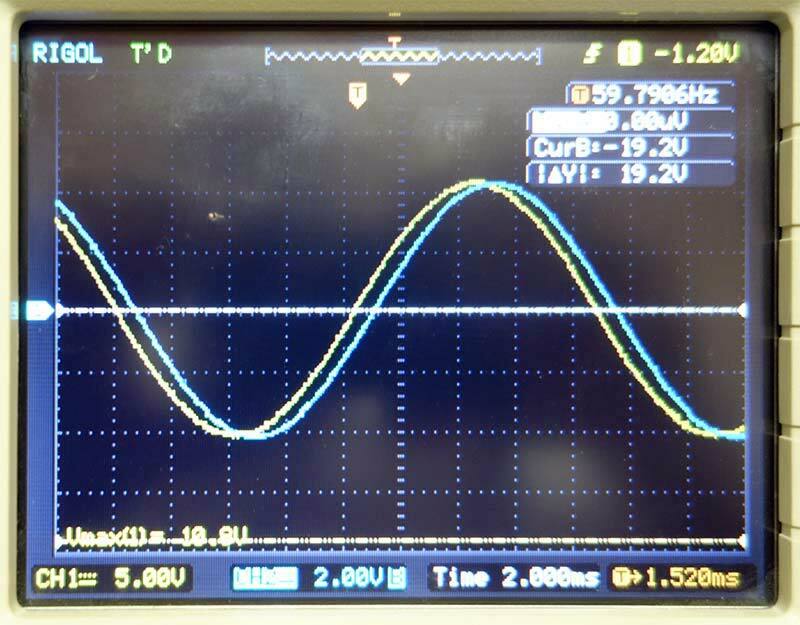 The oscillator frequency is determined by a quartz crystal, and the line frequency is controlled by the utility company. In some locations, this may vary by as much as ±0.5 Hz over the course of a day. The question is: How can we synchronize the crystal oscillator to the line? Almost by definition we cannot change the frequency of the crystal, yet it must be adjusted to the line frequency which may be anywhere from 59.5 Hz to 60.5 Hz. Assuming the 15.36 MHz crystal can be pulled ±5 kHz, that represents about ±325 PPM (or ±0.02 Hz) which is not enough to cover a potential discrepancy of ±0.5 Hz. 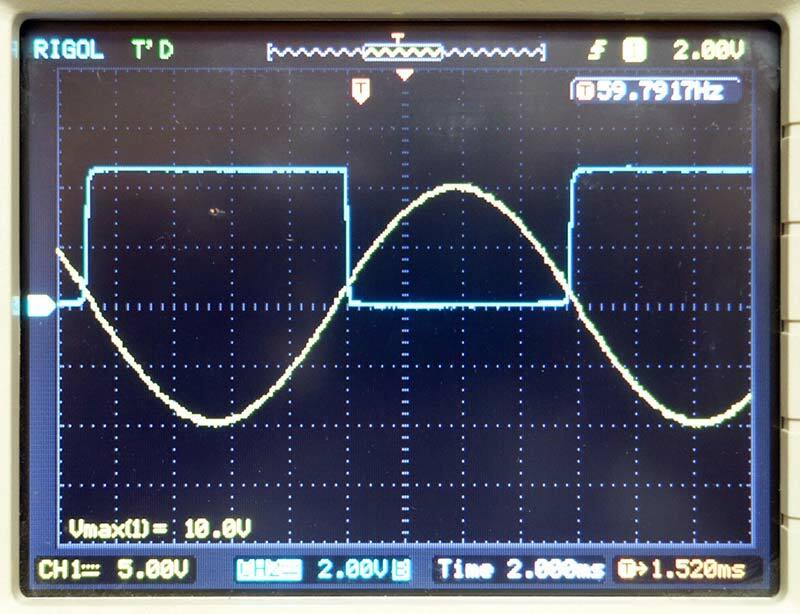 The synchronization circuit restarts the 60 Hz (blue) waveform at (nominally) the zero crossover of the 61.74 Hz waveform and effectively chops off a small segment of the oscillator’s 60 Hz waveform. This forces the 60 Hz oscillator waveform into the same time period as the 61.74 Hz line signal, at the expense of some distortion. Figure 1 shows the restart of the 60 Hz (blue) waveform occurs at about 190 degrees of the (yellow) line waveform. FIGURE 2. Normal line frequency. Line frequency (yellow) is 59.79 Hz. Oscillator frequency is 60.007 Hz. Difference is 0.217 Hz. Signals are synchronized with no discernible distortion. FIGURE 3. Low line frequency. Line (yellow) is 57.835 Hz. Oscillator (blue) is 60.007 Hz. 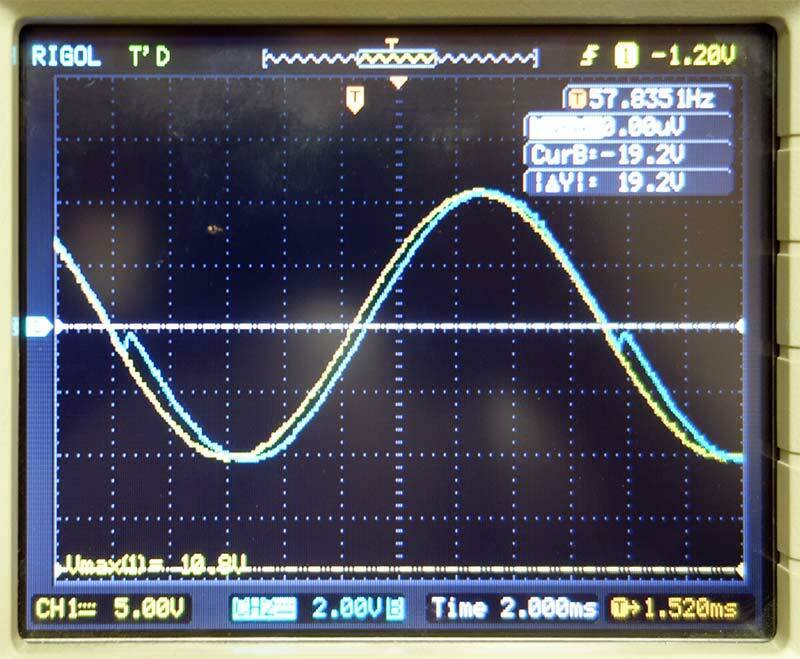 The oscillator runs for slightly more than a full cycle, thereby synchronizing to the slightly slower 57.835 Hz line. Before presenting the synchronizing software (in flowchart form), it is necessary to understand how this oscillator works. The synthesized oscillator uses NXP Semiconductors’ (formerly Freescale and before that Motorola) eight-bit MC9S08SE4 microcontroller. This processor contains an index register called ‘h:x’ where h and x are independent eight-bit registers. (The semicolon between h and x indicates that these registers are concatenated. They are read as one 16-bit register, even though they are two independent eight-bit registers.) They are used to point to locations in memory that contain a sine wave lookup table. In our case, h:x has been chosen to start at $f300 (‘$’ means a hex number) and end at $f3ff. The h register remains fixed at $f3, and the x register cycles through 00, 01, 02,…FE, FF, 00, 01, etc. Each memory location contains a point on the sine wave. There are 256 points (0-255), and each step is 360/256 = 1.40625 degrees. A table of memory locations is shown in Figure 4A. FIGURE 4A. Memory contents per memory location. This represents a sinusoid with a zero line of 128, a positive peak of 255, and a negative peak of 1. 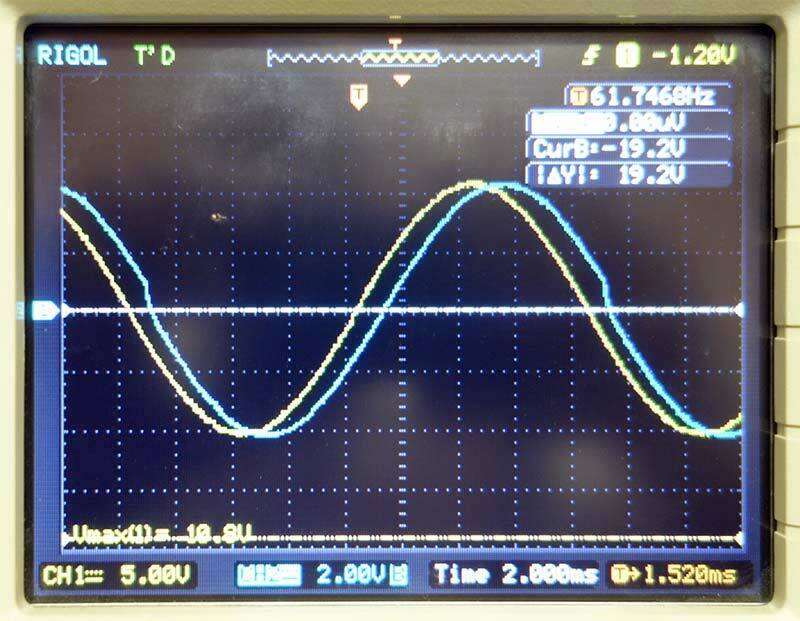 For purposes of this discussion on the basic operation of the oscillator, it is important mainly to understand that cycling through the x register points to a complete sine wave cycle. We are now ready to understand the oscillator as represented in the flow chart of Figure 4B. FIGURE 4B. Oscillator flow chart. Assume for the moment that the Wait time is zero (no wait). The fastest possible sine wave (for this processor and this software) will occur. 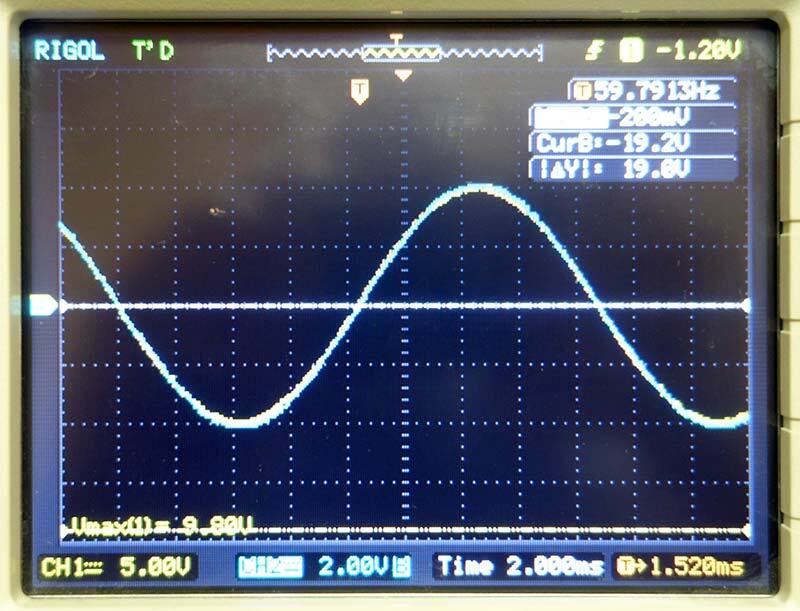 A point on the sine wave will be sent to the D/A (digital-to-analog) converter. 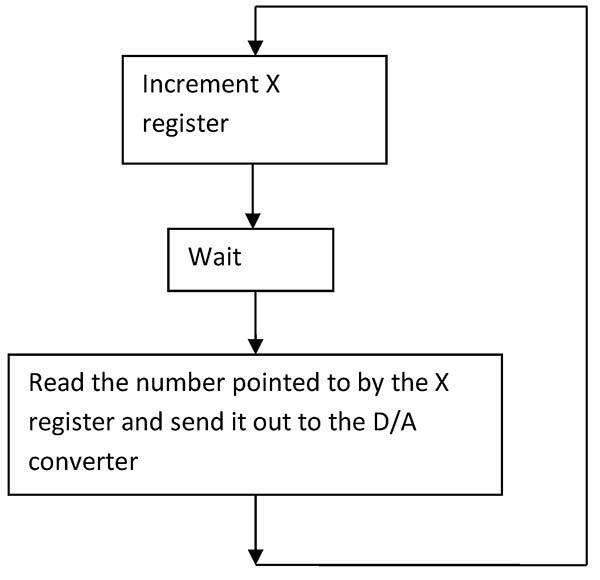 The X register will be incremented to the next point in memory. It will be sent to the D/A converter and so on. The X register will race around from $00 to $FF repeatedly, thereby repeatedly describing complete cycles of sine waves at the output. Now, suppose we introduce a Wait time of exactly 65.10416667 microseconds (how to get this exact delay will be told momentarily). Each new point on the sine wave will be sent to the D/A converter every 65.10416667 microseconds. Since there are 256 points on the sine wave, 256 points will take 256 x 65.10416667 = 0.0166667 seconds, which is the exact period of 60 Hz! In other words, this Wait time produces a sine wave with a frequency of exactly 60.000 Hz. The Wait box in the flow chart creates the delay by waiting for an interrupt from the timer system of the processor. Using a 15.36 MHz crystal, this processor will generate a bus frequency of 15.36 MHz/2 = 7.68 MHz. If a modulo 600 counter were used instead of the modulo 500 counter, interrupts would occur at 600 x 130.2083333 ns = 78.125 µs, and the output period is 78.125 µs x 256 = 0.02 seconds, or 50 Hz exactly. Using a modulo 75 counter produces exactly 400 Hz. Thus, the three main power frequencies can be precisely synthesized with a 15.36 MHz crystal, which is a stock part with many distributors. For example, suppose it takes a total of 30 µs to read the table, send the data out, and increment X. Then, 30 µs will already have passed and the system will stay in the Wait state for only another 65.18416667 – 30 = 35.18416667 µs until the next interrupt occurs. In other words, part of the interrupt time period is used to do necessary tasks and not just waiting. 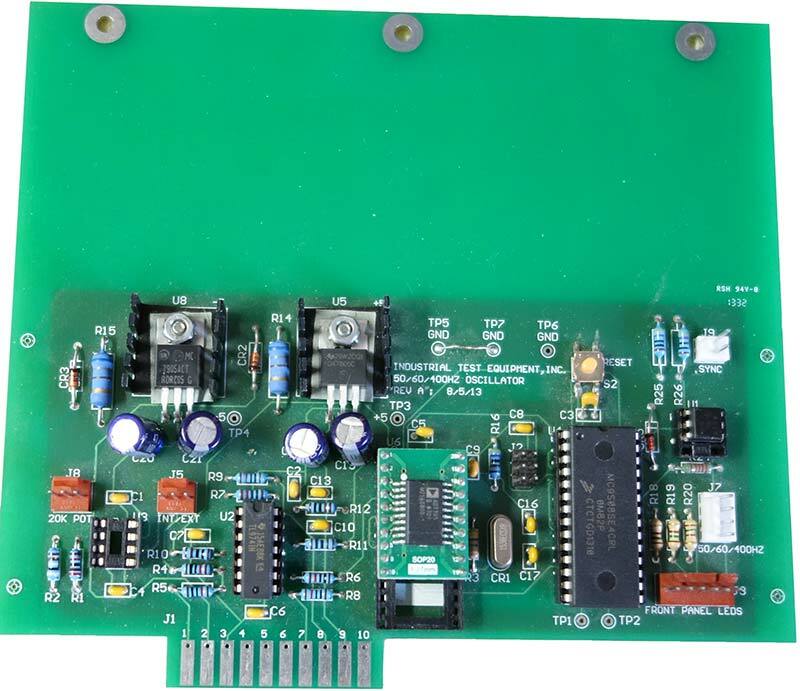 This system produces exactly 60 Hz, subject only to the accuracy of the 15.36 MHz clock. It remains now to adjust this frequency to the line frequency, which may deviate from exactly 60 Hz. The synchronizer adds some extra steps into the flow chart in Figure 5. Its function is to restart the waveform on the positive going zero crossing of the line voltage. This either chops off a small segment of the 60 Hz waveform or extends the running time of the 60 Hz waveform; in both cases, to make it have the exact period of the line. FIGURE 5. Flow chart of oscillator with synchronizer. The line voltage cannot be connected directly to the microcontroller. It is connected through an optocoupler such as a 4N35. The circuit is shown in Figure 6. Optocoupler U1 isolates the microcontroller from the AC line. 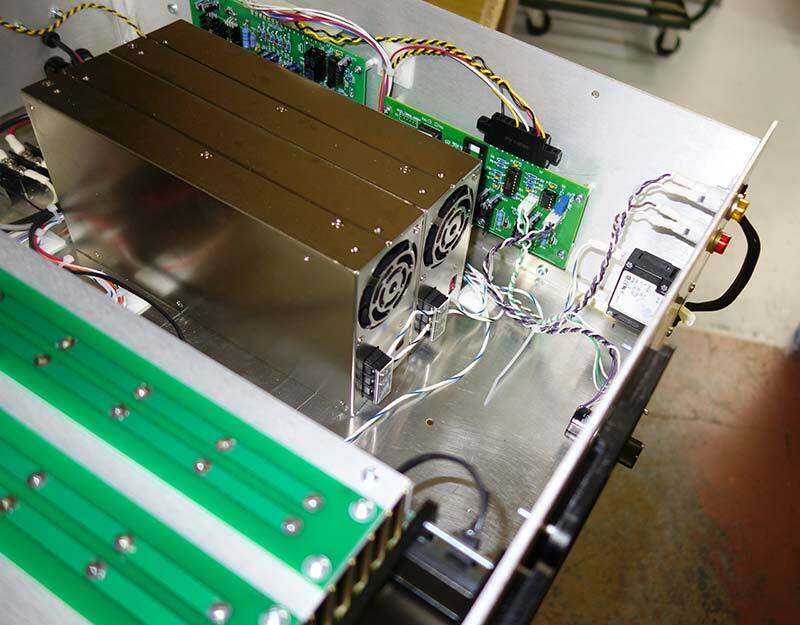 R25 and R26 are selected to limit the power dissipation of each resistor to about 0.33 Watts. The 115V line must rise to about 10V to cause a transition at B1, which means that it detects about 4 degrees and not the zero degree crossover. The resulting phase discrepancy is corrected in software. FIGURE 7. Optocoupler output (blue) vs. simulated line voltage (yellow). Consider the case where no line voltage is applied. The signal at B1 will be continuously High. That is B1=1. 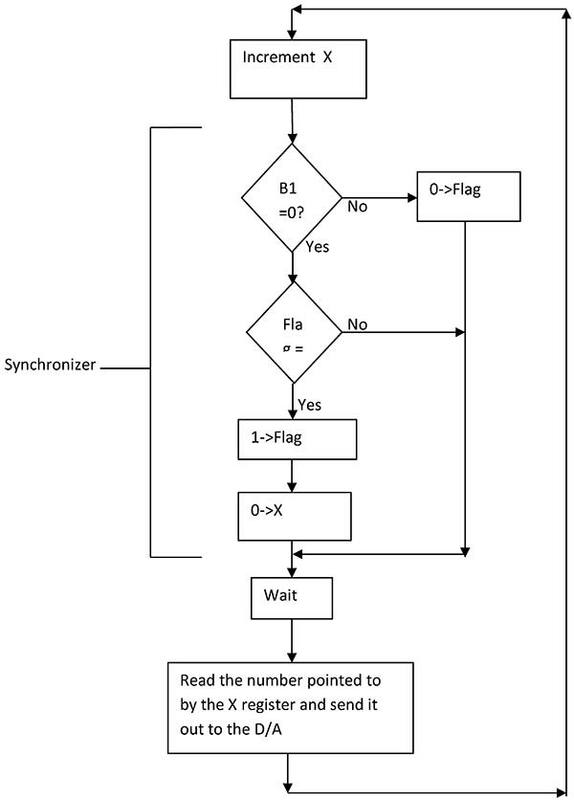 The flow chart shows that under these circumstances, the main part of the synchronization logic will be bypassed, and only the flag will be repeatedly reset (with no effect). The oscillator will work just as previously described. In other words, the synchronization system has no effect if the synchronization signal (line voltage) is absent. The six-pin programming header is located slightly to the left of the MC9S08SE4. It is used to program the micro. The SMD IC in the center of the board is a four-channel D/A converter. It uses an SMD to DIP adapter board because a DIP version of this IC was not available. 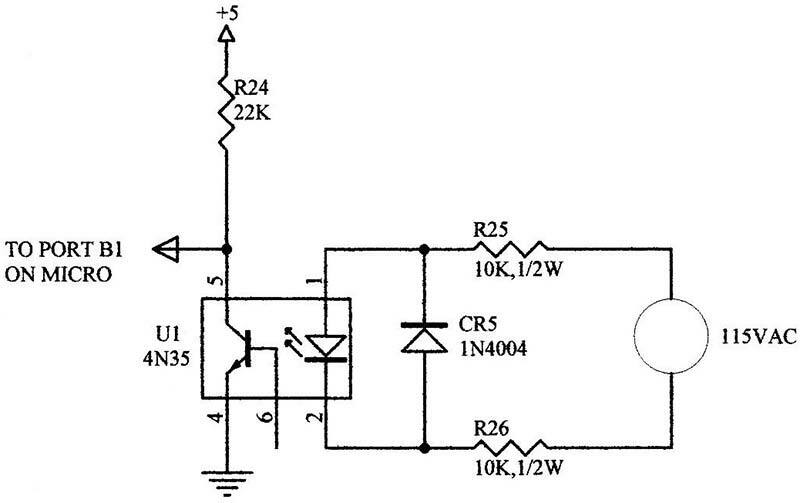 (It is a four-channel D/A converter which is used for three-phase operation of this oscillator).